Humans evolved over millions of years into today’s upright, bipedal walkers. Now, the evolution of some robots is on a similar track. Only the pace is much faster. In recent decades, we’ve gone from stationary robots performing repetive tasks to wheeled and four-legged robots. And now, bipedal bots are on the rise. Boston Dynamics has famously engineered some of the most advanced bipedal bots in recent memory (e.g., Petman and Atlas). But they aren’t the only lab working on two-legged robots that can walk like us. 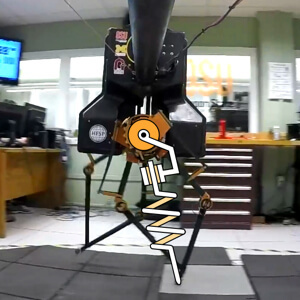 In a recent series of demonstrations, Oregon State University (OSU) Dynamic Robotics Laboratory has been showing off its own two-legged robot ATRIAS. 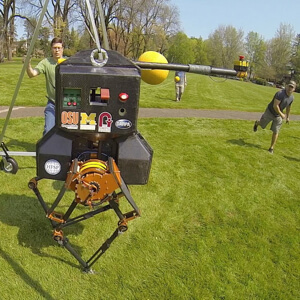 In a new video, ATRIAS takes a walk in the park—a kind of real world robot rite of passage proving it can work just as well outside the controlled lab setting. Walking outside is no mean feat for robots. Because the terrain is uneven and unpredictable, their systems and software have to be robust and adaptable. The robot is accompanied by a support structure and harness to prevent expensive damage if it gets tripped up (which did happen a few times). That said, it isn’t plugged into an external power source or otherwise supported as it walks. We’ve seen finely tuned balance and recovery abilities like these from Boston Dynamics in past models, where handlers push the the robot around to test its ability recover. And ATRIAS appears similarly capable of righting itself. Two more videos, for example, show its creators kicking and pelting it with dodge balls. ATRIAS’s balance and adaptability is a necessary trait if it’s to prove practical—but it isn’t enough. Future robots also need to be efficient enough to move for long periods without requiring external power-ups. According to the ATRIAS team, humanoid robots use over 16 times more energy to walk than humans. So, ATRIAS is designed for efficiency. The bot’s carbon-fiber legs use a series of tendon-like springs for suspension and energy storage—absorbing impact energy and recycling it as the robot picks up its feet. Like Boston Dynamics (prior to its acquisition by Google), ATRIAS is funded by Darpa. The advanced research arm of the military believes robots can transform search and rescue missions or aid soldiers in the field by carrying heavy packs. But better designs for robotic locomotion will have universal appeal. They may well find their way into industrial and consumer robots or even other obliquely related inventions. A recently unveiled spring-loaded, unpowered lower-leg exoskeleton, for example, has been shown to increase human walking efficiency. This might be useful for folks with disabilities or the elderly. Whether ATRIAS or some other, better design proves out in the end, mobility remains a key challenge in robotics, and such work is necessary to move robots beyond the current awkward toddler stage. It’s also key to note: Though walking on two legs like us is one way to get around—robots are in no way constrained by it. As much as it makes sense to mimic humans or other animals in some instances, we may also elect to make robots that are more unnatural. That is, expect the number of ways robots get around to further branch out. Future bots may patch together the best attributes of humans, beasts, birds, fish—and pure robot. Whatever the design, improved mobility added to advances in computer vision, sensors, and artificial intelligence, promises robots capable of a much wider range of physical tasks, from the military to industry. Follow ATRIAS on the OSU robotics YouTube channel or via Twitter—and keep an eye out for the bot’s final exam this June, when it will do a few tricks for a packed house at the Darpa Robotics Challenge.